I know I say this every time I visit somewhere, but I want to move here. In fact, I even think I found my apartment. My last visit I think was in, uh, 1983 – or something like that. So I didn’t remember much. But I do remember that when I left Spain (I was on an 8-10 month trip through Europe), I distinctly recall saying that I wanted to spend more time in Spain. So to prove that good things come to those who wait (and wait, and wait, and wait), I found myself back in the country. More specifically, in Andalusia. After walking from the bus station, admiring the Moorish architecture, apartment buildings with spacious courtyards and stunning terraces, the tiled patios and walls (I went to the post office to mail some postcards, and it had the most lovely tile work! ), and friendly people, I unpacked as fast as I could and decided to get down to business, and eat. Seville is small enough so you don’t need to worry about taking public transit, getting lost, getting bored, or going hungry. And not necessarily in that order. It seems like every other business is some sort of eating establishment and people eat at all hours – starting with breakfast in the morning, standing at the stainless-steel bar, sipping cafe cortado. Then later in the day, between lunch and dinner (whose hours I have yet to master), people crowd sidewalks cafes. But unlike in Paris where everyone is drinking beer or wine, in Seville, most tables seem to have plates of something that people are collectively digging their forks into. A few days isn’t quite enough to do Seville justice. And with over 3000 tapas bars, it’s hard to hit them all. But I was in touch with Shawn of Seville Tapas Tours (who gave me that staggering figure) and we met up my first day – and later that night – for some tapas action. 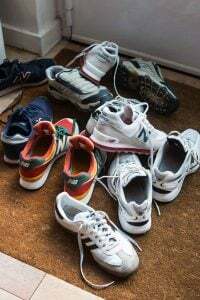 My only complaint was that I kept wanted to knock on my neighbor’s doors, the ones with all those delicious smells coming out of them, to find out what they were cooking. Not to be confused with some of the new-wave “gastro” tapas bars, which Shawn and Juan, the owner of La Azotea (above, right), quickly assured me this tapas bar was not to be confused with*, everything we ate was really impressive; fresh, ingredients impeccable sourced, and so delicious you never want to leave your bar stool. 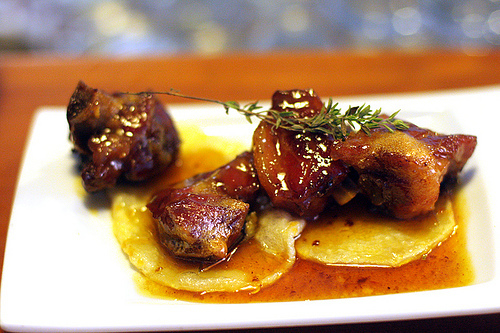 *It seems most of the gasto tapas bars don’t seem to have a reputation for great food, and are better known for culinary tricks and wizardry. And although it looked kinda fancy, the food didn’t rely on tricks and over-the-top presentations. This was ingredient-based cooking at its finest. 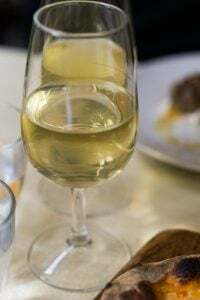 Big glasses of wine (at least for midday) accompanied the dry-aged beef and amazing clams with the tiniest artichokes I ever saw, meant that the rest of the day was pretty well shot. And I had forgotten the key rule of tapas: Don’t eat too much in one place. However it’s hard to stop when you’re eating well and having such a great time, being taken care of by a jovial staff, and surrounded by Spanish people enjoying themselves, nibbling and sipping their way through the day. After a little horizontal time, later that evening I met up again with Shawn and Eduardo at Casa Morena, located in the back of a tiny shop that was so packed, the ham was hanging from the rafters. The “kitchen” consisted of a gas-fired toaster oven. But no matter. 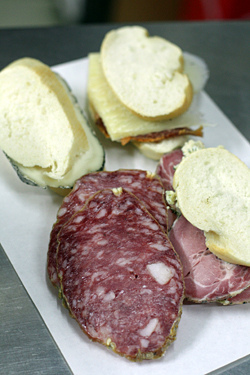 We snacked on small sandwiches stuffed with spicy chorizo and Cabrales (blue) cheese, blood sausage, and ham & cheese, while a group of men held court at the other end of the bar, obviously in it for the long run. 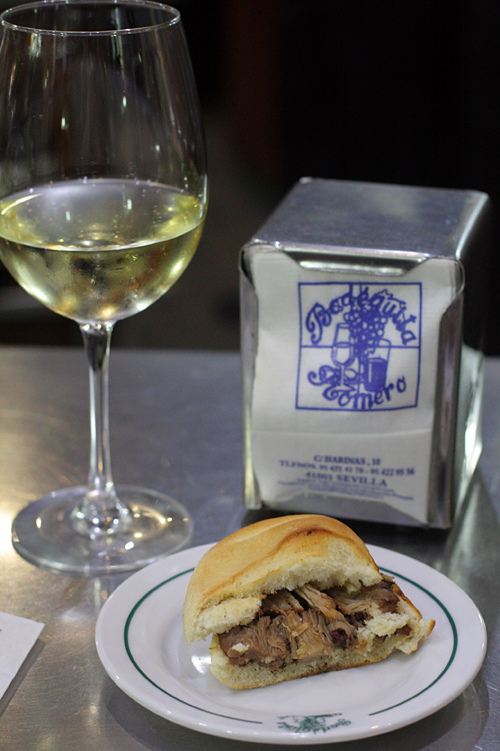 At Bodeguita Romero, I was introduced to sandwiches stuffed with Pringá. And more Spanish white wine, which didn’t really need any introduction, but was nice to be reacquainted with. There were also some tasty marinated potatoes, and a platter of raw bacalao, which was meant to be placed on bread with a spoonful of salmorejo, a red soup/sauce that is so thick, that Shawn told me that although it’s normally served as a soup, it does double-duty as sauce. The rest of the night was kind of a fog and I had to get to bed for the early meet-up with a baker the next morning. But when I dragged myself out of bed the next day and tried to revive myself with some strong Spanish coffee, I found this in my sack, evidently a souvenir from the evening before. It smelled heavenly. And so did I…from all that garlic! 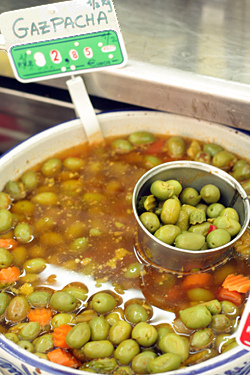 The next morning, after the bakery, I hit the old Mercado de la Feria (market) – and while I’m kicking myself for not bringing a bigger suitcase so I could stock up on marcona almonds and padrón peppers (another reason to rent an apartment; a stovetop to cook peppers! although be sure to make sure the open the windows, so you don’t have an opportunity to meet the Spanish fire department…), I did enjoy seeing all the hams, fruits and vegetables, and people standing at the various booths, enjoying a beer while they talked to their favorite vendors. Lunch (which I couldn’t believe I was ready for, after the previous night…) started – and ended – at Eslava. The tapas kept coming, and coming – everything from pork ribs in honey to lamb “dumplings” with pumpkin, and deep-fried little fish. Once again, I forgot that golden rule of not eating (and drinking) too much in one place, and was so full I had to head back home for another siesta. And to get ready for another night in Seville. Seriously great report, David. I love France but seeing all of the beautiful tapas and other Spanish delights, I can understand the desire to move there. I’ve spent time in Barcelona and couldn’t believe the tapas, and the wine, and everything else! It may seem great for a tourist coming for a couple of days, but the prolific conversion of all shops in the cities of Spain to tapas joints, hotels, bars, and short term apartments has made it quite unlivable here. 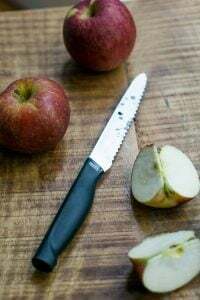 I live on the very edge of the center of Barcelona’s old town, but like most of us here, I will have to move to an outer district as it has gotten exceedingly hard to find even simple things like butchers as more tapas bars spring up. As most probably/should know tapas aren’t even Catalan or Andalusian, so it’s even more painful that because tourists keep asking more keep getting created despite having nothing to do with any region outside of Basque Country. The next time you stop through Barcelona and look around the center, no one from Catalonia/Spain lives here anymore. It has and continues to suffer from the same problem as Venice and as much as people enjoy going out to all these tapas places, keep in mind that you’re helping to destroy the culture of the place you’re visiting. There are the same issues in Paris and many of the popular neighborhoods, such as the Marais and the Île St-Louis, which have less residents and more short-term visitors. It’s a balance cities that have a lot of visitors cope with; the influx of tourist income is vital (tourism is the #1 source of income in Paris, and a lot of people find work – and tax income is generated – because of it), while keeping cities affordable for residents and people that live and work there. This is a tough piece to read considering I have nothing to eat at home. Luckily, where I live in Valencia suffers from a similar embarrassment of riches in the food department. Miquel: So what are you saying? That no one should be allowed to travel? I rented a flat in Gràcia this summer and I can tell you that the Catalans who took my money did it gladly so save us your “Barbarians at the Gate” routine and stay home yourself if it suits you. I lived in Seville for a few years, and my husband is from there. Right now we live in Barcelona. While the food here is incredible, the amazing tapas in Andalusia plus the low price is unbeatable. That means you can actually go to a few places in one night like you did. So happy to see this great post by you! just a question. What do you mean with ‘air-dressed meat’? It looks a bit confusing for me. Oooops sorry… air-dried beef. Anyway, it’s confusing for me. well… but do you know the spanish word for that kind of beef? I don’t understand if you’re talking about ham (Serrano / Ibérico), tasajo, cecina, etc. Awesome post, David! Seville is a wonderful city and Andalusian people are llvely, yes everything is cheaper there, maybe that’s why everybody seems happier than in the rest of Spain. I am a Barcelonian girl, living in London, so there you go! Looking forward too to the post about the bakery. The bread down there is a serious thing, isn’t it? 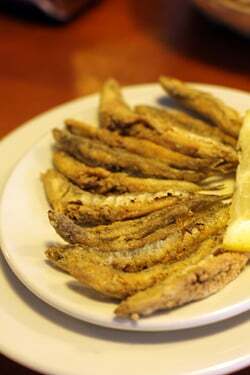 And what about the “pescaito frito” those guys really know how to fry fish! Olé! 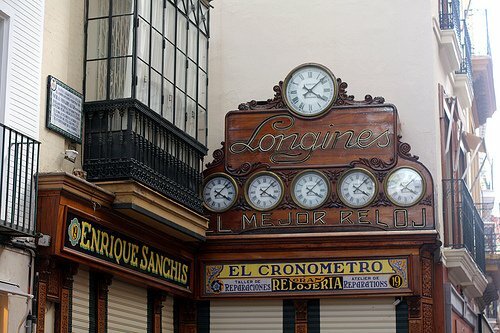 The laid back atmosphere of eating in Spain is hard to beat; a lunch ‘break’ that lasts 3 hours or dinner at 10pm! Andalucía is one of my favorite regions. I don’t blame you for wanting to live there. Wow! What a wonderful trip! And yes, that is a lot of wine! Oh my God! This is what paradise must look like! You’ve hit so many of my favorite places. How lucky am I to call Seville my home away from home? Regarding your Expedia experience, the SAME thing happened to my when I was trying to book tickets to Argentina! They advertised one fare and then pulled the whole bait and switch at the end! (This was with Orbitz and OneTravel). It is incredibly frustrating and pretty shady. I noticed your photo of yemas- I had them when I traveled to Ávila, but can’t say I was smitten. 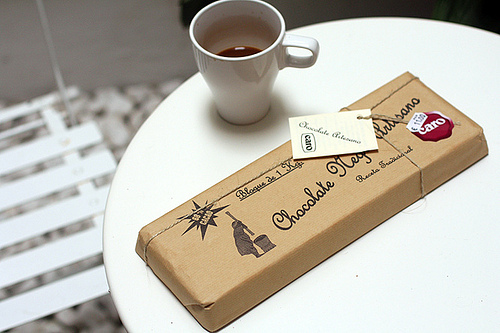 Beautiful post, I think I will be dreaming of Seville the rest of the day. 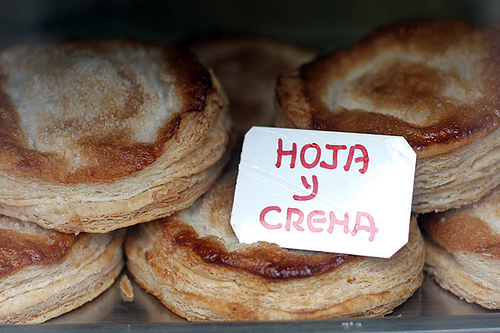 Many of the egg yolk-based Spanish pastries are (very) rich and sweet, and definitely not for everyone! Ah! Seville! I was there last October but only for 3 days. Such a beautiful, cheerful place! Did you catch a flamenco show? Love that area of Spain! It is my dream to have a vacation home in that area some day soon. Love everything about it. It is very affordable, especially if your used to big city prices. I arrived via Paris and was sticker shocked(in a good way) when I looked at the first menu in a restaurant. I think airlines/ travel sites, once they have your IP address, change their prices once you do a search for that particular flight. It has happened to me many times. There was some scandal a few years ago when Orbitz was charging Mac users higher rates because presumably they had more money. I do empty my cache often when using travel sites, because if they see you are looking again for fares/rates/etc, they up the price. But in this case, I clicked on the price which was the same…until it came time to pay. Although Paris can be pricey, I think restaurants are fairly affordable. There are a lot of small places with €30-35 menus for 3 courses, which includes tax and service compris. In a city like New York or San Francisco, I can’t imagine getting an entire meal for that. Seville seems especially reasonable and it’s nice to be able to enjoy a wide range of foods and wines, especially the amazing Spanish hams. I always love reading your travel posts and looking at all of the glorious photos. You just brightened my day in flood-ridden Boulder County, CO. Thank you! I needed a little slice of Spain today. I love Seville, it’s one of my favourite European cities. Amazing to visit whilst the Easter Feria is going on, full of eating, drinking and partying whilst dressed in full flamenco dress, a wonderful experience that I’ll never forget. Just looked at your post and I’m starving again right after breakfast and I have to leave for work NOW. Thanks!! Perfect! Luckily (and happily) I am travelling to Seville in just a couple of weeks time. I love ‘local’ places (don’t we all – finding those hidden gems) so this is certainly a good bucket list for whilst there. Thank you! I also wanted to move to Spain after I took a bus tour there 10 years ago. Seville was definitely a special place to be in. I wonder, what is that building in the very last photograph? David as always you have inspired me! Spain it is for the summer holidays. I am moving to Spain for a short while next year to learn Spanish and hoping to lend an internship in Europe somewhere. Seville is definitely on the must-visit list, among many other things. Although ´m from Basque Country and Spain is not all Seville, I´m glad to see over here. 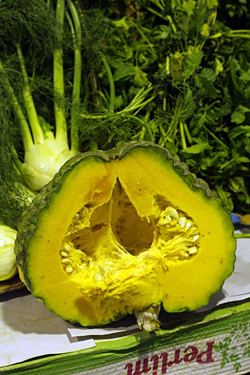 I´m a fan of your blog, your cookbooks and your work. It´ll be nice you could visit us in Basque Country, as Dan Leppard did it a year ago. 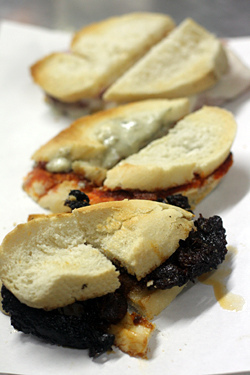 Good Tapas or “Pintxos” in basque country are one of the best things to do in a good night. I’ve been to the Basque region a few times and it’s great. (And Catalonia as well.) I was doing a workshop that’s taking place outside of Seville, but would welcome the opportunity to return to the Basque country. And if you follow the Guadalquivir river through Seville passing magnificent Cordoba and just as it meets the Atlantic you will be in Sanlucár de Barrameda. I studied in Sevilla for 4 months and this post definitely makes me miss all the amazing food there. 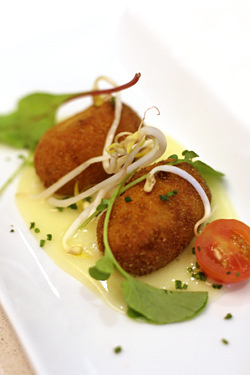 The croquets were some of my favorite tapas. Excellent recommendations. Now all I need to book a ticket to Seville. Ohh David! I was just in Granada (which I’ll be blogging about shortly)! What a shame – would have loved to meet you. It’s been a long time since I was in Sevilla as well, but Granada was just incredible – excellent (free!) tapas and stunning architecture, plus a plethora of Arabian teahouses. Very different from Galicia, where I live. 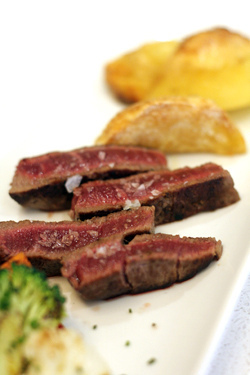 If you ever want to visit us in northwest Spain, we’d gladly be your gastronomic tour guides! There’s a lot to eat here too, and totally different from Seville. It’s worth the trek, I promise! just a point about the comment of Jess for all those who aren’t spanish or don’t live overhere. Tapas are not for free, they’re just served aside the drinks your order. It’s the common use in some provinces, but not in others where you have to order them separately and they’re paid as separated items as well. 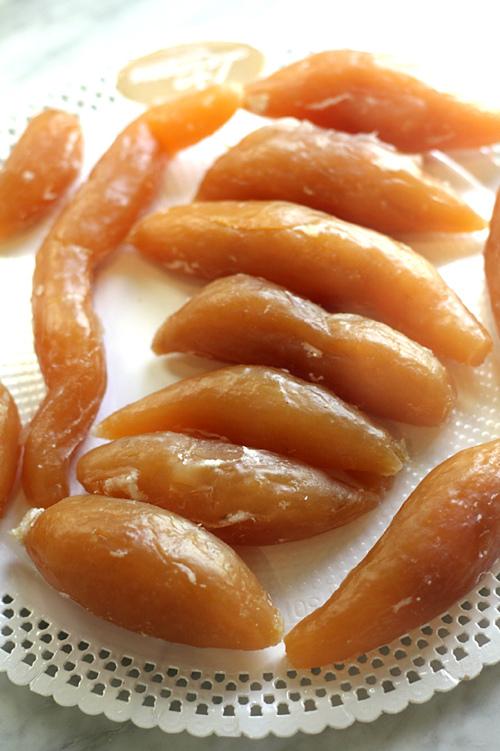 The Arabs invented the process of candying fruit to preserve them. 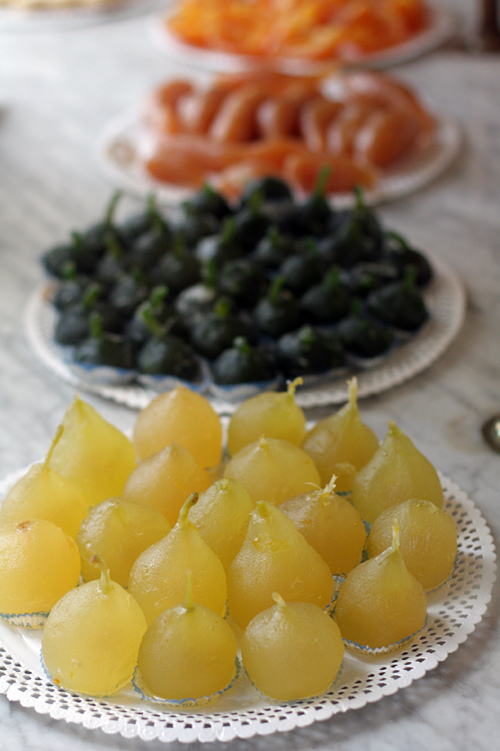 Syria was and still is the epicenter of candied fruit and vegetable. 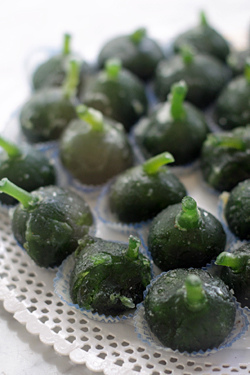 My favorite is candied eggplant. I hope that you will have the chance to visit Syria one day. Every time you post something like this it makes me miss Europe. The olives, the bread, the cheese! The desserts!!! I think I just need to move there. Another entertaining/informative article and pictures. Anxiously awaiting what comes next. What a wonderful, evocative posting….thank you. 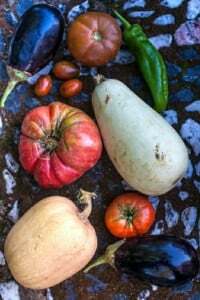 Youand/or your readers would, if interested in Spanish food, do well to get a copy of the always well-informed Claudia Roden’s “The Food of Spain”. It’s a predictably large, comprehensive, well illustrated (gorgeous cover, for that matter), engaging book. I think it came out last year or, perhaps, in 2011. 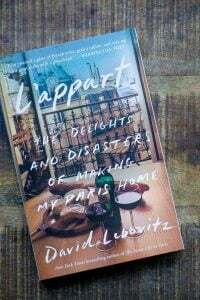 In any case, it’s a wonderful book to read through, even if you don’t happen to be sitting at your kitchen table, swinging an oxtail around in your hand and wondering what to do with it. My partner (who’s French) and I go to Spain regularly….Barcelona every May and Andalusia every Fall. 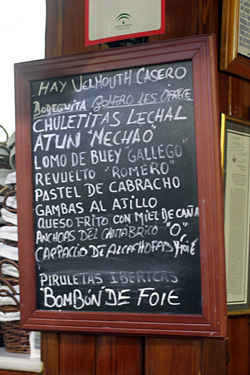 As for those ever-proliferating Tapas bars &restaurants?…..our two favorite joints in Seville are ones that we found by following our noses up an alleyway, having realized that we’d probably waited too long before getting lunch. In each case, we found ourselves at the door of a small place, faced with a large woman who told us that this definitely WASN’T the sort of place we wanted…..they served just “ordinary” food….no “tapas” or margueritas, thank you. In both cases, we assured her that we were tired of the same old tourist-food and could we PLEASE eat here? It was lovely. I mean that. We ate lunch and dinner at those places for the rest of that particular stay. I told him “Might be the case, I guess….”. His was, as you’ll realize, the sort of profound ignorance before which one can only bow in defeat…..and, no, I didn’t ask him what he thought gazpacho was made out of, or why half the land between Seville and Barcelona was covered with greenhouses….were the spaniards raising cows in those things??? I know what you mean about the pleasures of having a mini-fridge and a 2 burner stove over maid service. We travel to Barcelona often (our summer home is in SW France so the Bordeaux airport and cheap flights to Spain are very close) and we fell in love with padron peppers and order them every place we can. Last summer we decided to give Portugal a try and rented a tiny apartment in Porto overlooking the river – amazing place, you’ve got to check it out. Right along the river, amidst all the restaurants were tiny shops selling, among other delights, kilos of fresh padron peppers – a euro or 2 per kilo. And you’re right, leaving a window open is essential during preparation. Problem is, once we’re back in San Francisco and see the price of those peppers at the Ferry Building market – $6 for 1/2 pound, it makes a trip back to Spain or Portugal seem the cheaper alternative ! Not that I’m complaining. 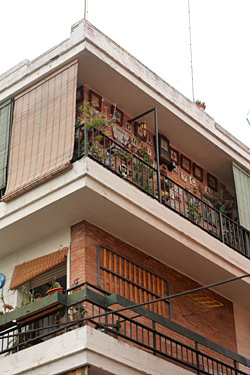 BTW, we were in Bologna this summer and stayed in a flat above Tamberinis – wow ! 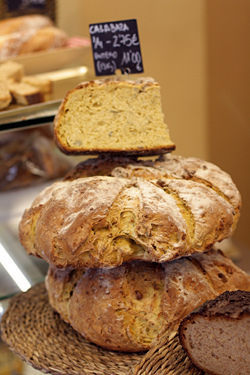 We also visited your recommendation for where to buy gelato and got the green tea & squash flavors – fabulous !. How great to see this and relive the past couple of days of tapas with you here, and also see what other stuff you got up to. 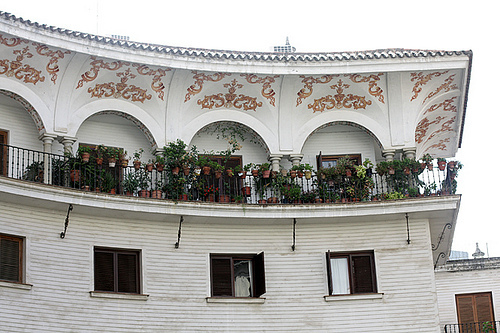 You’ll get no argument from me that Sevilla is a wonderful place to live – would be great to be neighbours some day. To the person who said “as most probably/should know tapas aren’t even Catalan or Andalusian”, I’d like to point out that tapas are indeed Andalusian in origin. 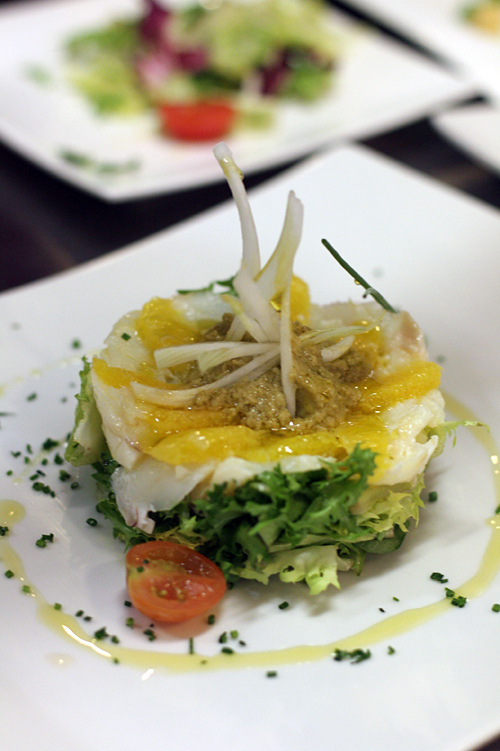 Pintxos are a different style of “small plate” food that originated in the Basque country. And while pintxos are more popular in the north of Spain it seems that tapas are now served just about everywhere, though they vary a lot from region to region. Loved the pics – you really captured the feel of Sevilla. Wow David, how perfect that you posted this today, as I am at my desk planning my trip to Spain next month! I have just shot off an email to Shawn, hoping he can hook up with us when we’re in Seville. 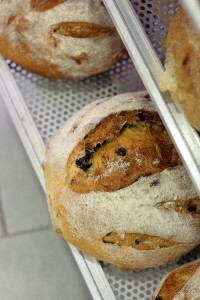 Hope to read about the bakery soon, so I can put it on my list to visit as well. We’ll also be going to Barcelona, Malaga and Cartagena… any recs there? Thanks so much for a(nother) great post and fabulous pictures! Oh, David, I loved this post today. 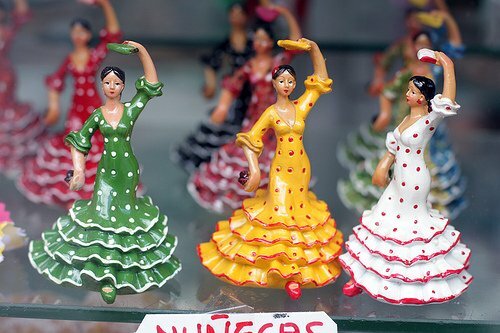 We went to Seville about 10 years ago and it completely betwitched me; the food was fabulous, although I kept getting that ridiculous Macarena song stuck in my head everywhere we went. Gorgeous post and photos and now I’m craving a trip back. We traveled to Seville last year and loved it and all the cities we were privileged to explore. Your post reminded me of the wonderful food we had there – those tiny crispy fish were one of my favorites. Do you know what kind of fish they are? Leslie, it strongly depends on the tapa you ate. Usually the fishes used are hake, cod vg, named as Soldaditos de Pavía or in the form of buñuelos; or a kind of tiny shark know as cazón overhere for the tapa named Bienmesabe (funny name as far it can be translated as something like it-tastes-good :-) ). It’s also a common tapa/ración a dish of asorted different fishes like with tiny sardins/anchovies (boquerones), flat white fish like acedías (arf, so hard to know the name of that fish. Maybe ‘plaice’? ), tiny hakes and some others. But that’s beside the point. What a ridiculously abundantly beautiful place! Thanks for persevering amid wifi woes. Can’t wait to see more! How wonderful! 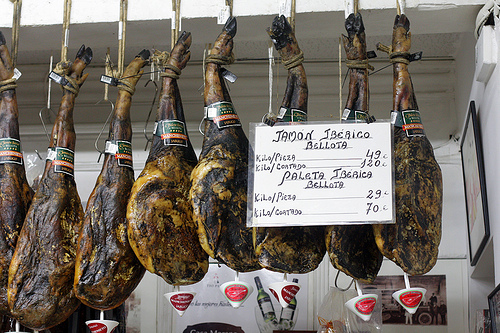 I have never been to Seville but your post made me feel like I was there and could smell and taste and see it all. Thank you! Jose, I was in Andalusia in March. Tapas did not come free with drinks in Seville, but they did come at no additional charge with every drink ordered in Granada, until you started ordering directly from the food menus. You’re right, it is not the same everywhere in Spain. But knowing this helped us keep from ordering items when we first arrived, and so we wouldn’t over-order. 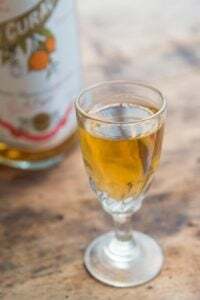 I was taught this Granada nuance by Shawn of Sevilla Tapas mentioned here — I was also lucky to meet her when we spent a few days in Seville during Holy Week. She gave us all sorts of advice for AMAZING food in Seville and Granada, and I recommend her and the city to my friends who visit Spain. So exciting to read David’s comments here too. I travel often and there are many wonderful places in the world, but Seville holds a dear place in my heart! I totally agree with Shawn about our tapas. It’s an important part of our culture and I’m glad you have reflected the atmosphere of Sevilla in such a great way. Thank you for let me breath a little bit of Andalucia! I’m heading to Paris next week and your blog it’s a great source of information. Thanks for that too! That grocery store joke you made actually happened to me once. I stocked up on kitty litter because it was on sale, until I got to the register. When I complained about the price, I walked with the cashier to the aisle and sure enough, they had ripped down the sale sign and upped the price, while I was buying eggs! Anyways, looks like a fabulous trip, as always. 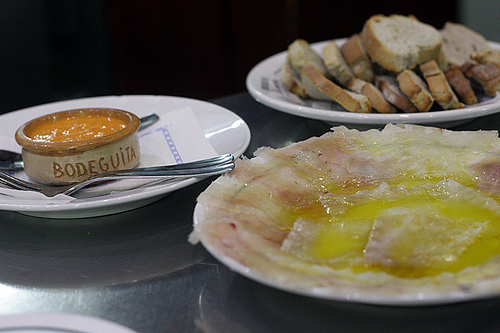 I may even show my Spanish students your flickr pix of tapas. They’re beautiful! Dear David, thanks so much for the great posts and pictures. Having lived in Spain for two years (in Madrid) it bought back great memories. Hope your apartment has an inner courtyard where the clothesline is and that you are not on the bottom floor! Also nothing so great as smelling the olive oil from everyone’s meals. tortilla was our staple dish! Will so look forward to your posts over Feliz navidad! I also have the nomad syndrome. How do I cure it? Now you made me want to move to Seville. I have lived in Palma for three years and somehow never travelled to Seville. Shame on me. I love your pictures! They are stunning in a humble way. I’m never sick of your posts. Can you explain how the fruit and potatoes was candied. Fabulous post David, thinking it is time for me to return to Seville also. Have wonderful memories from a previous visit. Sorry I won’t make your “discussion” at Shakespeare and Co, like I caught your pop up at Candela last year!! Off to Boulder and Vancouver next week. Any suggestions? If you come to the Costa Blanca drop by and say Hi. The food here in Spain is amazing! And I can say that even though I’m a vegetarian (bad place for veggies!). Those olives at the top look gorgeous and get me every time I go to the local markets. 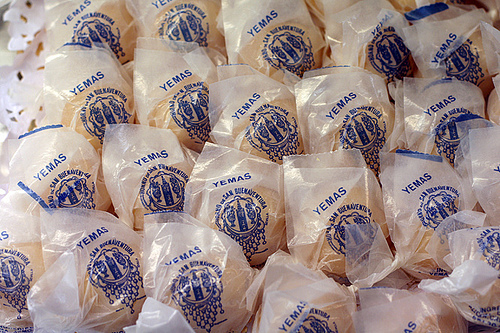 The yemas on the other hand, even though I have a sweet tooth, have never really done it for me. Enjoy España! P.S. Love all the photos on this site. Thank you for this~! What a lovely post, it sounds like a beautiful place~! 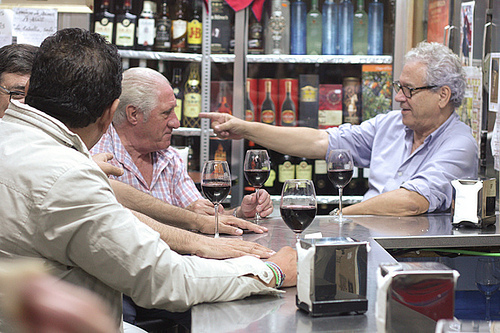 Okay David, next time you go to Sevilla you have to go to a little place called Alvero Peregil and order the orange wine. You will go crazy over it! I tried to get the winery to send me a few cases but they said they don’t ship to the U.S. :(((( What a happy, fun place… I want to move there too! You should get an apartment there!!!!! I don’t why Miguel comments that tapas are not Andalusian. Are you implying that tapas are from the Basque Country? 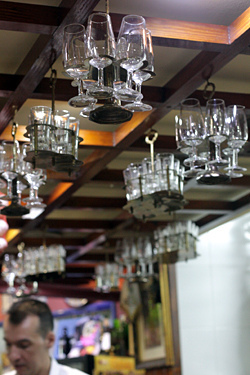 The word tapas when first introduced to the Spanish was considered and “andalucismo” or Andalucian origins. Tapas are historic to Andalucia and you find entire provinces where tapas are free with your drinks like Almeria and Jaen. 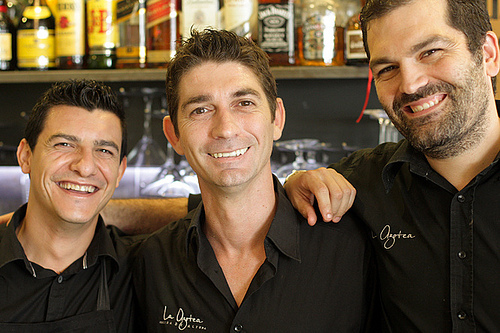 Like Ferran Adria says tapas is not a way of eating is a “way of life” for many Spaniards. 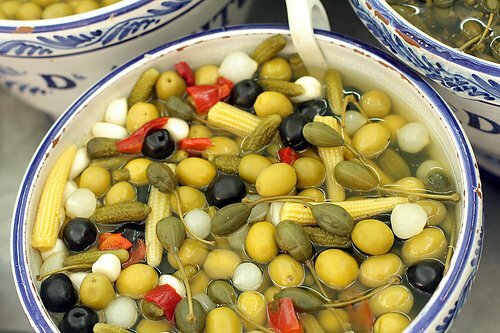 The origin of tapas is confusing but we know that they are traditional in many parts of Spain, especially in Andalucia. I understand your frustation with “tourist” tapas bars but tapas are part of Andalucia’s heritage. David the egg-yolk custards are also historic especially around Seville where the convents where they were made received the egg yolks for free from the sherry region nearby. They are definitely an acquired taste. I especially love “tocinillo de cielo”. 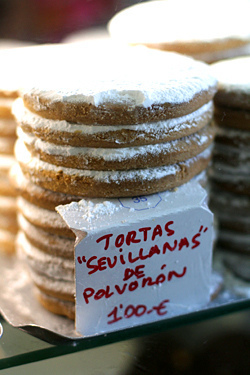 +One of my current food obsessions are olive oil tortas imported from Seville and sold at Bryan’s market in San Francisco. 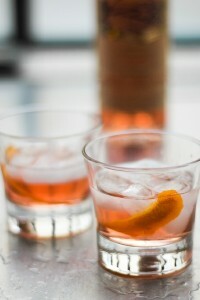 They come in savory (rosemary & Thyme, sea salt) and sweet (plain serry or orange flavored). After looking at them for months, I finally bought a package and now I’m hooked. 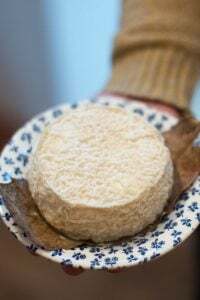 They are large crackers individually wrapped in oil coated wax paper and are sturdy enough to use for sandwiches and tasty enough to eat on their own. 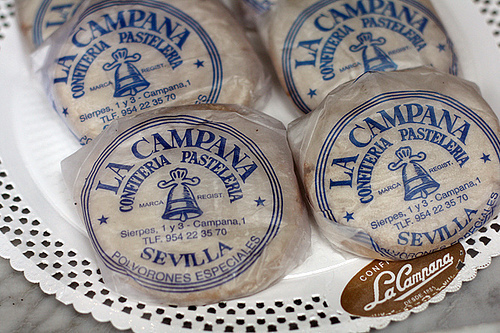 If Sevillanos can make crackers this good, I imagine everything else is fabulous. Love your posts, David. Pastel de cabracho is a new one for me! Is that a regional dish, or have I always just skipped over it because I didn’t know what it was? Cabracho is a scorpion fish, and the picture looks like something that my Bohemian grandmother used to make and she called it a fish loaf. hmmm…not sure I’m brave enough to revisit that one. Lisa, Pastel de Cabracho is not a new dish. 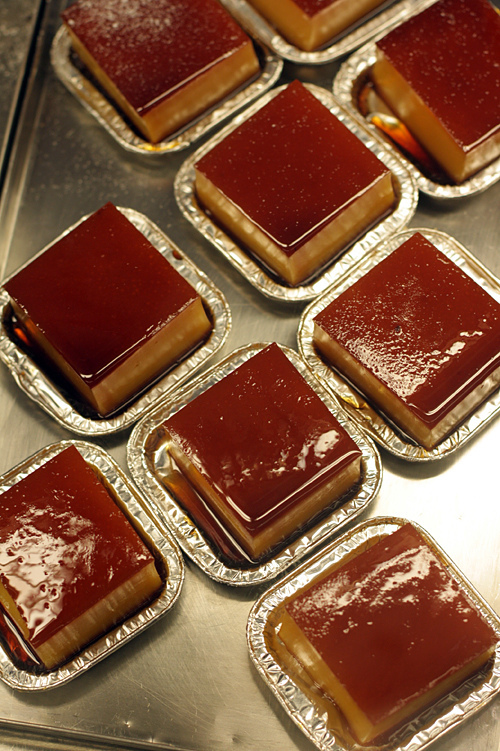 It’s a traditional dish from Basque Country that was made popular by José María Arzak in the late ’70s. What a great post!! To tell you the truth, I haven’t really considered Spain to be high on my list of places that I just can’t wait to visit. But after reading this post and looking at these beautiful pictures — well, Spain just jumped way up there! (I must add, too, that viewing some of Mike Randolph’s beautiful pics of Spain have added to that change in spirit…) Great post! Beautiful pictures. David, your enthusiasm for travels and different cultures and people — it’s just is so refreshing! I can’t wait to read your next post! Love, love, love this post! I, too, signed up for a tour with Shawn (well, not Shawn personally, but with Peter from Azahar) when I first landed in Sevilla last fall. It was my second time to Spain, first time to Andalucia, and my first time traveling abroad solo. 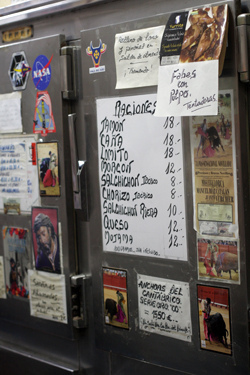 What fond memories, and I loved the pringa at Bodeguita Romero. This post just brings all the sensory memories back….wish I were there now! David – thank you for this lovely story and beautiful photos. I really enjoyed seeing the food, the buildings and the shops. I’ve always wanted to visit Spain and have never been but it felt like you took me along with you. 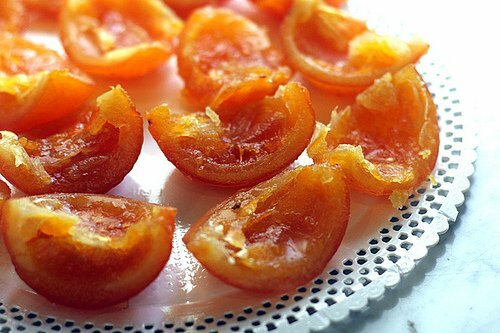 Wish I could have just a tiny taste of those candied oranges! Thank you for a very enjoyable read. I remember Seville being full of great and friendly people and awesome food. If you haven’t been, you should go to San Sebastian and Bilbao, they hare amazing, amazing restaurants. 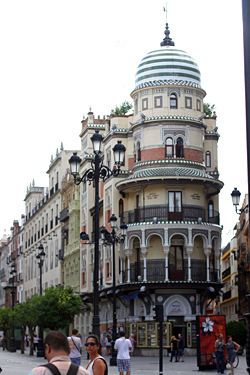 The center of town is called centro, and it’s very convenient to get around Seville by foot. New York is a big tourist trap turned into an urban mall…sans the traditional stores and restaurants that used to populate… Everything is hipstered and expensive… The only recourse is Chinatown……but how much Chinese can you eat ?? Sad state of affairs !!! WOW! A seriously good Blog today. I am off to Seville – someday. Thanks for the great post. I was in Seville in July for a two weeks of flamenco classes and I look forward to going back. A friend introduced me to three excellent tapas restaurants along the Alameda de Hercules, the names I can’t remember but one was Eslava. We also ate at the cafe inside the mercado that serves fresh seafood. Incredibly fresh gambas a la plancha with a cold beer. I don’t think I would’ve found that by myself. 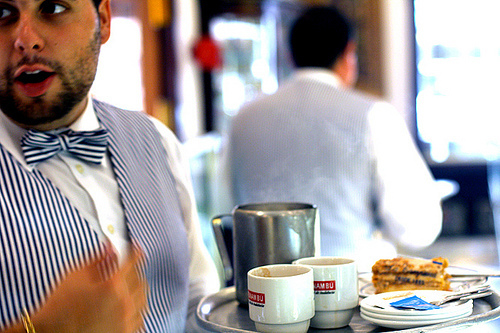 Next time, check out the cafes at the foot of the bridge into Triana. One of them was the highlight of the trip. My absolute favorite tapa is Tortilla de Patatas. 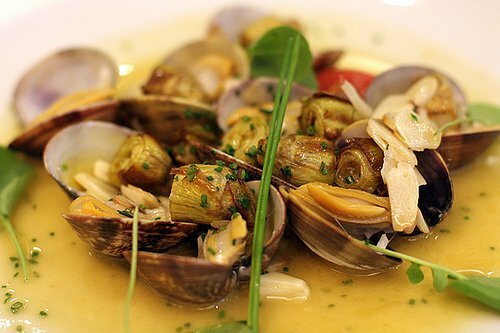 I was 17 and backpacking through Europe with my best friend when one bite of this accompanied with a glass of cheap red wine had me fall in love with Spain. Would love to see your take on recipes for your favorite tapas! You are seriously writing great stuff here. I love Spain! Lived in Madrid once, wish I was back. Thank you! We recently went to Cordoba for a few days for the first time and can thoroughly recommend the fried aubergine with “honey”, which is really molasses. Oddly, it tastes wonderful! It is known as a dish prepared by Spanish Jews, before they fled or converted, presumably. We’re still looking for the perfect place in Seville! 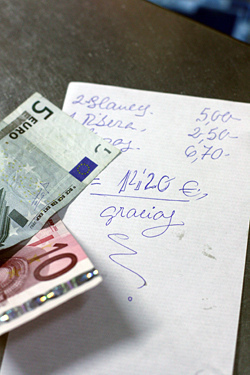 Having read so many of your posts about Paris and the price of eating there, I am not surprised you find Spain cheap! I live in a small non -tourist town near Alicante and I admit to being astonished at the sheer number of cafés and bars that open up – and largely close down again because there are too many of them. I can understand the proliferation in tourist areas but the rest of Spain is suffering from very high unemployment and surely, eating and drinking out is going to be affected? The comment about the spanish not eating vegetables made me laugh. 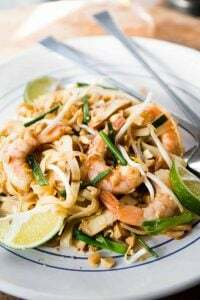 It is true that here, if you go to a restaurant, vegetables do not seem to be a priority and heaven help you if you happen to be vegetarian! 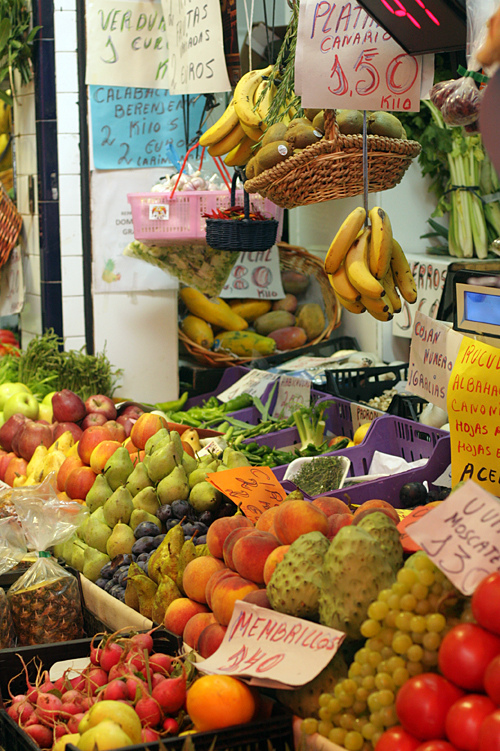 However, you see the locals buying bucket loads of veg in the markets. I suspect the reason is that meat was, for a long time, a luxury few could afford and so now, it is viewed as the most important part of a meal out, often being served, more or less, on its own! David, re the coffee – I think the spanish have it instead of blood. Go into one of the electrical stores (MediaMarkt) and you will see more coffee machines than you ever thought existed! The elderly men sit outside drinking it laced with brandy, from about 7am! Beauty. I wish to be in Seville. And can’t wait for your new book. Thank you for the wonderful post! Your descriptions and pictures gave me a surprising visceral nostalgic vibe. My ancestors are from Seville. There are still many “Galvan”s there. I need to go back for a visit soon. It always surprises me that when I step foot into Spain, I get this peaceful home feeling though I haven’t spent much time there. Love and appreciate your work and passion. A correction your statement that Mac users were “charg[ed] higher rates” for hotels. English is a tricky language. CNet’s “rewording” of the original WSJ article shows that they don’t understand the difference between the verbs “to pay” and “to spend.” To say Mac users spend more on hotels (WSJ article) is not the same as saying Mac users pay more for hotels (CNet). Yes, Mac users tend to choose more expensive hotels, but they pay no more to stay in those hotels than non-Mac users: they were never charged higher rates for hotels. 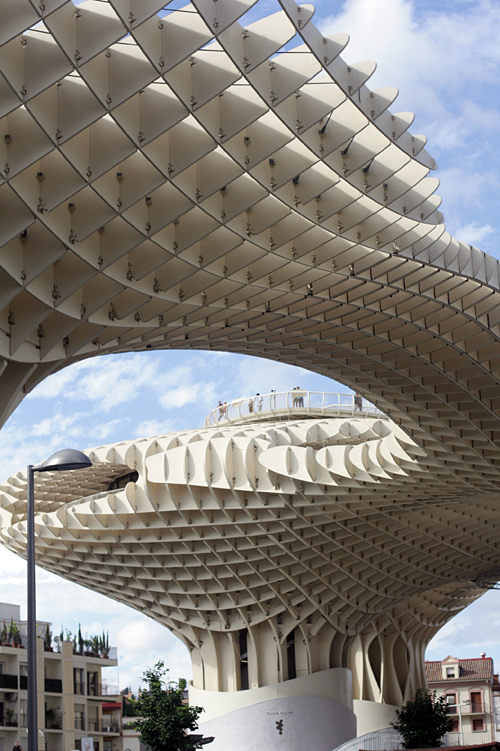 I love Seville, the people, the food, the parks, the architecture [classic and modern]. Had a great time there October last year. How I wish I had seen your post earlier! We just returned from two weeks in Andalucia and although there were many highlights, food was not one of them. Even at the time, I suspected this was more about my inability to find the good places than Spain’s abundance of them, but still it was a disappointment. Something about traveling “en masse” with my husband and three girls (one 24 years old, two 12 years old), made it tough to hold out for a better place when 5 tummies were rumbling and tempers running short… We wandered into too many “cafeterias” and tourist traps with fake paella and bad pizza. (And a really bad churros experience, on my birthday no less.) Your post convinces me to give Spain another chance in the food department and do a little more homework in advance next time. Thanks for the great photos and commentary! One of the good things about having a (good) guide is that you increase your chances of finding the good places. (Depending, of course, on the guide.) That’s why I contacted Shawn before I came – although I did venture out on my own and found some great stuff. The food in Seville is less-seasoned that some might be used to, although I was pretty happy with most everything I had. And you can’t go wrong with the ham and the chorizo from the region! Thank you for this post and the lovely pictures! I am nervous when it comes to attempting to cook Spanish food, but this looks so good, i’ll have to give it a try. Why do you torture me so? I’m sitting in my office on a cold rainy day in Philadelphia going through my inbox when I see an email with the subject line Seville. It brought back memories of my visit there many years ago. I could almost taste the food and sip the wine. A superb article. But please don’t do that again. Great post! Makes me want to go to Seville straight away! Also, thanks for your Stockholm post, which I used a lot on my trip to there last month. Very nice post and great photos.. I hope someday I will be there too… The city looks amazing with its history and amazing foods! I was in Seville just a few days ago and found the tapas at la Brunilda Galera No5 (El Arenal) 41001Sevilla definitely worth the walk through the twisty streets. Tel. 95.422.04.81 and email brunildatapas@gmail.com. So much cod fish everywhere – but try the fritters here and you won’t be disappointed. If the tuna tataki is on the menu, try that one too – cant’ miss.